I can’t lie; it has not been easy making money in energy in the last 12 months. 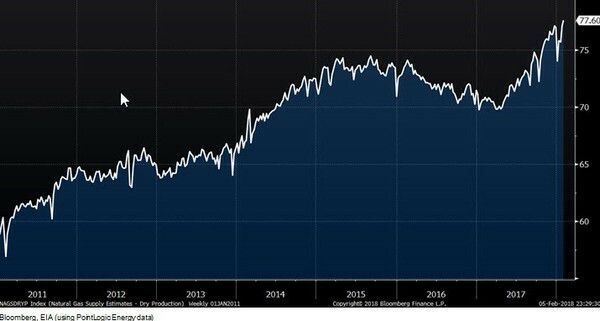 Oil stocks haven’t followed oil up, natgas prices are at the mercy of fast growing production and pipeline & logistics companies are suffering from too much debt and rising interest rates. In 2017, I was lucky to post a 19% gain, creating $570,000 in capital gains from a $3 million portfolio. Today, I want to outline the problems with investing in the most common sub-sectors in energy, and then at the bottom, remind you that I have been giving away my top pick for free for months on my website…and it has been one of the best performing energy stocks for the last year. And I think it will continue that way through 2018. I focus on smaller companies, where I can speak with management, and where there are not so many people following the company. Long awaited pipelines out of the mammoth Marcellus gas play in the US northeast are now going onstream. Drilling efficiencies are steadily increasing at an astounding 20-30% a year, dropping breakeven costs (says Chesapeake) to $2/mcf. Footage drilled per natural gas directed rig increased an average of 22.2% per year from 2011 through 2016 (from 132,000 feet per year per rig to 355,000). Not even the most bullish drilling engineer predicted that. And of course we have the long standing issue that more frac sand in a well, and longer wells, is bringing up more natgas per lateral foot every year. On top of all that, investors have had to deal with management teams who have no discipline and just increase production with no thought to increasing shareholder value. It has been so sad to watch these stocks get decimated; crushed…even from the sidelines. To this day, my only investing ideas in natgas are from the short side. In Canada, the natgas situation is even worse as we have not built up markets other than the USA, which needs our gas less and less. Last year, natgas in Canada had negative pricing for several days in the summer and I expect a lot more of them in 2018. Everytime I speak with a Canadian oil & gas management team I ask them to send me their 2018 projected cash flow, pricing natgas at ZERO; $0.00/mcf. I know they’re doing it internally. Moving over to to oil….the problem with oil stocks are…many. First, oil did well in the second half of 2017, rising 50%, but oil stocks did not. I moved into oil stocks in September and October…and the sector as a whole did not move up with oil; serious underperformance. That has been really frustrating. Second—in the USA, most “oil” stocks are very gassy—and get gassier as time goes on. See notes on natgas above. I expect natgas prices to remain very low through 2018, keeping the actual realized price for “oil” producers to be just over half the WTI price you see quoted on your screen every day. There are a couple exceptions, including the oil stock I’ve been been allowing my “free-list” subscribers to download for free for months—the oiliest stock in the USA. You can go now to www.oilandgas-investments.com and right in the middle of the site you can see where to click to download my report on it for FREE. The Most Profitable Oil in the USA. In Canada, it’s a different problem(s). Canadian oil is shallow compared to the US, so it’s a lot easier to find true oil stocks (as oil gets deeper and “cooked” more with more pressure & therefore heat on top of it, it turns to natgas). The economics for Canadian oil stocks are even quite good at current oil prices…but nobody wants to buy Canadian oil stocks. Special interest groups have succeeded politically in driving anti-oil agendas in both Ottawa, the capital of Canada, and in the far western province of British Columbia. As a result, international capital—which is the institutional money needed to make these Canadian oil stocks go up–has zero interest in Canada right now. I only own one Canadian oil producer; my other Canadian-listed stocks are producing oil in other countries. economics based on a cartel holding back production. 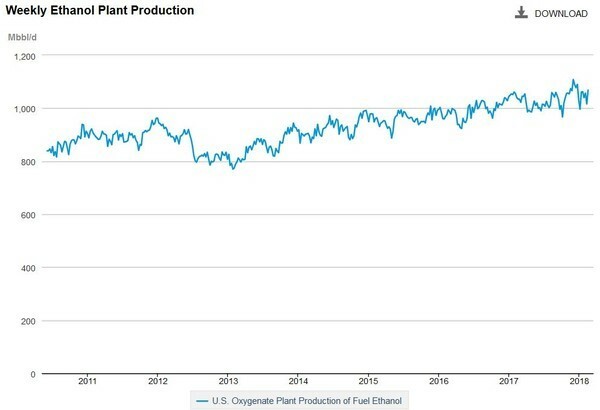 Ethanol inventories have been slowly but steadily increasing every year since 2014…when Pacific Ethanol went from $3-$23 in eight months. Arguably, January-February is the time of year to buy ethanol stocks, but production keeps increasing. Producing oil, gas and ethanol are what’s called the “upstream” part of the energy sector. Upstream is where the energy is closer to being in the ground, and downstream is when the energy is closer to the consumer. I also look at downstream markets; electrical power companies and refiners are downstream-type companies. Some refining stocks—particularly Valero (VLO-NYSE) did well last year, on the strength of high (but not really rising) crack spreads—until Hurricane Harvey hit. Then these stocks went into overdrive; the Valero chart in particular was a textbook breakout and I should have bought it. But I couldn’t have called the Hurricane or its impacts. As I watch different small-cap power companies—whether it’s energy storage or solar inverters or hydrogen or software for peak power management—I notice that a lot of press releases go out with multi-million numbers in the headline and then I check the income statement for the next few quarters…nothing. No increase in revenue; nothing from these big-number-press-releases hits the income statement. I watched one TSXv-listed small-cap company last year announce over $7 million in contract announcements in 2017. Q4 revenue was $75,000. The whole sector loses credibility when that happens, and it happens often. So those are some of the pitfalls of owning energy stocks—upstream and downstream. But there are exceptions to every rule (except natgas sadly). Successful investor have to find a business model that’s a bit different from the norm, or have exceptional economics. With oil stocks, that means you have to find producers with wells in their main field, their growth engine, that pay back their cost in well under a year. Very few companies can do that—but one of the few who does, is available for free at my website—www.oilandgas-investments.com. You don’t have to sign up to trial my paid service—you just get it for free, so I can show you the type of research I do. Download the report, and read about a stock that I think ticks all the right boxes.